It wasn’t all that long ago that women were considered homemakers, child bearers and little else. Even after women started to achieve some modicum of freedom it was often difficult for them to be taken seriously. Now, decades after women started winning rights that were arbitrarily denied them just because of the fact that they were women, the world of business is full of female entrepreneurs that are having an enormous impact on the state of affairs around the globe. These women are icons of empowerment, and discussing their success is an important way to celebrate their victory in the face of untold obstacles. It is now becoming clearer than ever that women actually can do whatever they set their mind to, just like men can! In order to bring attention to the successes of female entrepreneurs around the world, AllFinanceTax has created a handy little infographic that you can see below. 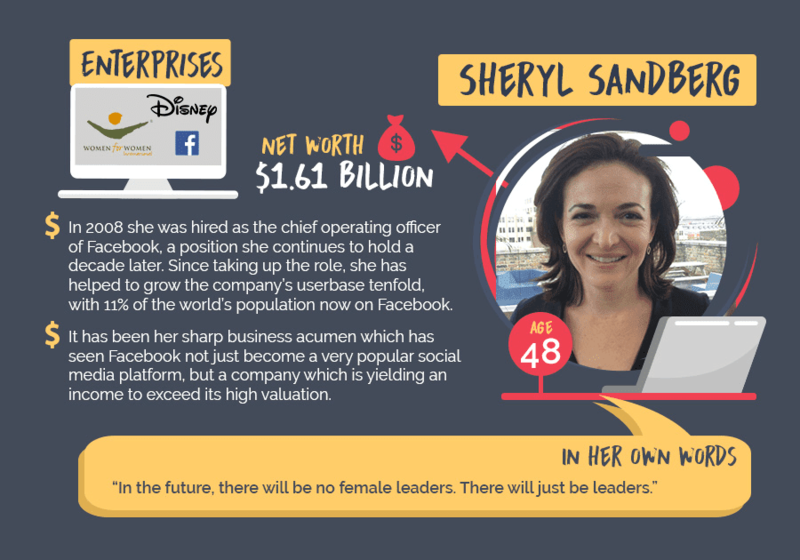 This infographic describes the industries that these women have excelled in and how they are influencing the way these industries function. You would be surprised to see that a lot of the industries move away from traditionally “feminine” industries like cosmetics! Having spent a Large part of her 20s greeting visitors at Walt Disney World and selling has machines door-to-door, she took a chance on her shaping underwear business Spanx at the age of 29 after pouring her life savings of $5,000 into the idea. Following plentiful rejection from investors at the outset of the business, she is now the owner of a company which takes in an annual revenue of $250 million, with a net yearly profit of 20%. In her own words, "Don't be intimidated by what you don't know. That can be your greatest strength and ensure that you do things differently from everyone else." She co-founded HTC in 1997 and has grown it into one of the world's Leading electronics brands, most notably in the smartphone market. Prior to setting up HTC, she had become reasonably wealthy from manufacturing mobile phones for other clients, but it is her success with HTC that has seen her evolve into a globally respected businesswoman. In her own words, "As entrepreneurs, we must continue to ask ourselves 'What's next'. It takes humility to realise that we don't know everything, not to rest on our laurels and know that we must keep learning and observing." The Indian businesswoman has been the CEO of PepsiCo, the world's second largest food and drink company, for the past 12 years, having worked her way up to the Lead role gradually since joining the organisation in 1994. Her business acumen is matched by academic excellence - she holds degrees in Physics, Chemistry and Mathematics, an MBA in management from an Indian university and a Master's degree in Public and Private Management from Yale. In her own words, "Leadership is hard to define and good leadership even harder. But if you can get people to follow you to the ends of the earth, you are a great leader".